Invented by nature but genetically manipulated by man, a mutation of the H5N1 virus—aka the “bird flu”—has fallen into the wrong hands. Angered by sanctions placed against its nuclear program, a rogue state is determined to release it. Their chosen method: one of the Black Widows—female suicide terrorists of Chechen descent who have the highest kill rate of any terrorist organization. By infecting her, then instructing her to detonate in the United States, her body will become the real weapon, spraying the virus into a crowd. The only thing standing in the Black Widow’s way is the Taskforce, an extra-legal counterterrorism unit. Racing against time to prevent a global pandemic, Taskforce operator Pike Logan and his partner Jennifer Cahill follow the trail across Southeast Asia to the United States, only to learn that the enemy they face may not be the enemy they should fear. 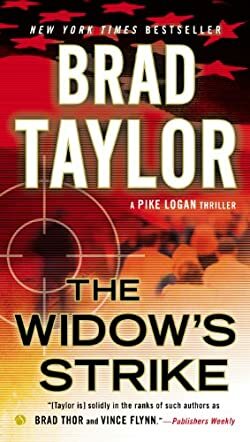 The Widow’s Strike ties together government-sanctioned terrorist activities, nefarious multinational conglomerates, and frighteningly plausible science. Infused with authenticity from Brad Taylor’s decades of service as a Delta Force commander, it’s an explosive ride alongside America’s counterterrorism operators that will leave readers breathless.